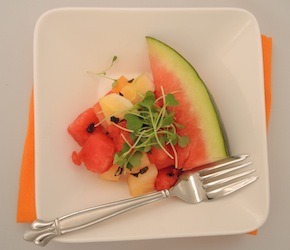 Seedless watermelon will work best for this recipe but any watermelon will work in a pinch. Dice watermelon into one inch cubes, remove the rind. Using hydroponic grown watercress chop the root off and gently wash and pat dry. Stir the lime juice, olive oil, dried jalapeno (finely minced if using fresh) and salt together, toss with the watermelon and watercress. Serve this salad chilled.